John Doolen creates fine jewellery from the Tasmanian Marine Opal. Each individually designed piece is carved using diamond cutting tools and hand polished in the same way as other gem stones, which are often incorporated in the designs. ...a most cherished expression in Tasmanian jewellery. Please keep in mind that no photo can do justice to the irridiscent colours in the real marine opal. Who says you are on the scrap heap when you are pensioned off because of many health problems. I John Doolen a master jeweller back in the mid 1980s was to face the dilemma of retreating from everything. Plagued by the immune system going haywire and arthritis rearing its ugly head in many parts of the body, put the brakes on living and working. A few years later being married to a beautiful Christian woman called Christine helped my disjointed living become less of a burden and encouraged me to do other things when a good day came about. Being gifted with an artistic and inventive mind was cause for much frustration at not being able to utilize my God given treasures. The reading and study of God’s word becalmed me immensely, giving my mind at least peace and contentment even though my hands wanted to be intensely active. Moving from Rockhampton to Cairns opened the door to fiddling with musical instruments, well I had worked on some before my illness and as my health settled down somewhat I could concentrate for short periods and gain knowledge about how all the different instruments operated. I even designed and made many tools and jigs over the years to carry out the repairs.The joke was that sometimes I could not remember what the tool or jig was for, Christine would shake her head and laugh, which eventually led me to making a detailed list of whats what.Oh, there were a couple of jigs that I never found answers to and a mouth piece puller that is still unfinished. Have you ever heard of a boomerang flute!! I hadn’t until the music teacher turned up with one and the story was, take two sisters having an argument and one using the flute as a weapon.OUCH, but it did not stay looking like a boomerang for long and no sledge hammer was needed and no panel beating marks were seen.The two sisters must have cried all the way home from the bank being $250.00. poorer,thats good discipline. How gracious has God been to me over many years of illness. Now living in Launceston and one day walking along the beach thinking of the loss of my darling Christine, I spied scattered amongst the seaweed and flotsam several pieces of abalone shell which I scavenged and to my delight upon polishing revealed the beautiful colors of the opal. These pieces of shell inspired me to make some simple jewellery for the grandchildren. 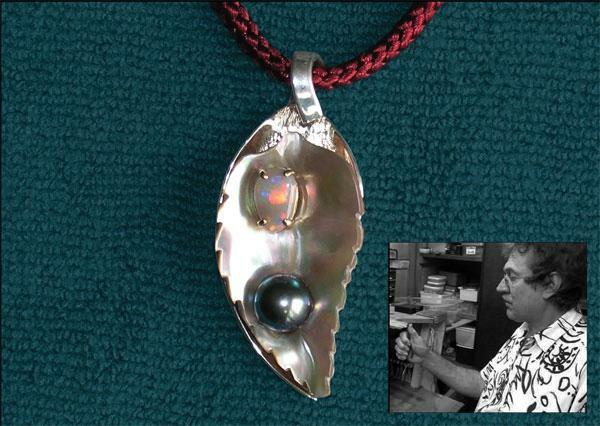 I made a very lovely pendant in the shape of a sail with an Australian black pearl for a friends daughter in law, to which everyone exclaimed, John, you must do more of these, this pendant is exquisite and the shell so amazing!! I am inspired by the beauty of God’s creation to shape His treasures into beautiful works of art to be worn the world over. As my Lord and Saviour,he guides me in all that I do. Upon one of my usual visits to the doc. he instructed me to keep active, to keep using the brain otherwise some of my health issues would escalate rapidly,seeing as I was getting my appointment times and days mixed up. Turning up for a MRI scan a week ahead makes for a very long sit in the waiting room. Now two years later I have designed a number of pieces incorporating many of our Australian gems. The abalone shell is called the marine opal of the sea, a very fitting title indeed, a gem treasure from the depths of the ocean floor.As in cutting and polishing opal I need to be careful with the shell to bring out the color or make a mess of it.Cutting out a design in the wrong direction will have the color disappear when polished. 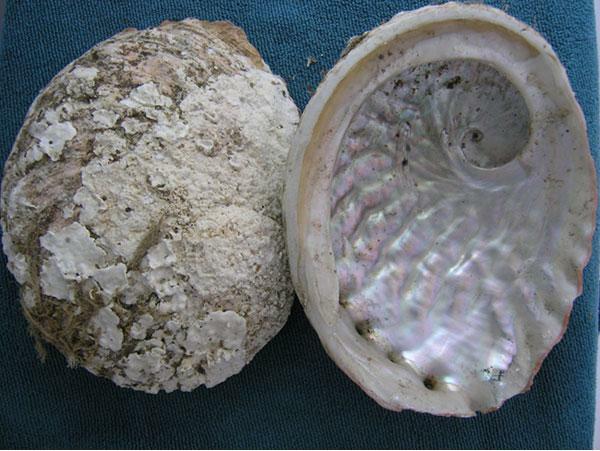 No two shells are identical so each piece becomes a very personal treasure. Unlike The NewZealand shell where the back of the shell is ground away and polished or dyed and coated with an epoxy resin, I leave the shell in its natural state. One design that was first mooted was a tongue in cheek pendant of a map of Tasmania in marine opal shell with a tiny Australia in silver hanging off the bottom.We know how often mainlanders forget that we exist down here in paradise. Even international tourists think it is a great souvenir to take home to remember a wonderful Tassie holiday. The most difficult task so far is matching leaf patterns and color for earring sets and designing special fittings for them. I am now working on a series of jewellery pieces using Tasmania’s famous timbers such as Huon pine. The combination of abalone shell and our beautiful timber is proving to be a winner. My treasured supply of timber comes from my dear friend Bruce who makes the small jewell boxes for the very special pieces. Is this the first time anyone has taken the marine opal shell and used it to make fine handcrafted jewellery? The simple and elegant leaf pendant at$50.00 in sterling silver or the breath taking pendant set with opal and a black pearl in silver and gold at a $1,000.00 which took many weeks to complete. When I am out walking the dog I am constantly looking at God’s beautiful handwork and often take home leaves to copy. I will continue to count my blessings each day as I tackle the next stage of this journey in letting the public know of my website where many pieces are displayed for sale or even visit the workshop where it all happens. The marine opal is a treasure from the depths of the ocean floor surrounding the rugged coast of Tasmania. “I am inspired by the beauty of God’s creation, to shape His treasures into beautiful works of art to be worn the world over. As my Lord and Saviour, He guides me in all that I do.